More than 30,000 teachers on strike in Los Angeles are hoping they'll soon be back in the classroom as marathon negotiations continue behind closed doors over the holiday weekend to break a contract stalemate. Add Los Angeles as an interest to stay up to date on the latest Los Angeles news, video, and analysis from ABC News. "I hope they get this figured out soon. It's exhausting," Melissa Berlant, a striking sixth-grade English teacher, told ABC News. Monday, a school holiday for Martin Luther King Jr.'s birthday, will mark the eighth day since teachers in the nation's second-largest school district walked out of classrooms and formed picket lines after talks on a new contract with Los Angeles Unified School District officials broke down. 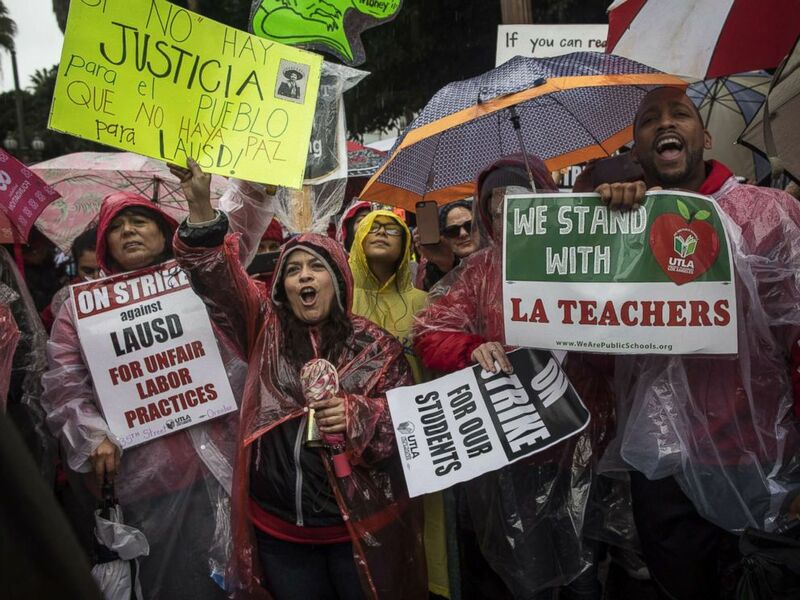 Representatives of the United Teachers of Los Angeles and the LAUSD returned to the bargaining table on Friday and continued to negotiate Sunday in marathon sessions being facilitated by the office of Mayor Eric Garcetti, a potential 2020 candidate for president of the United States. 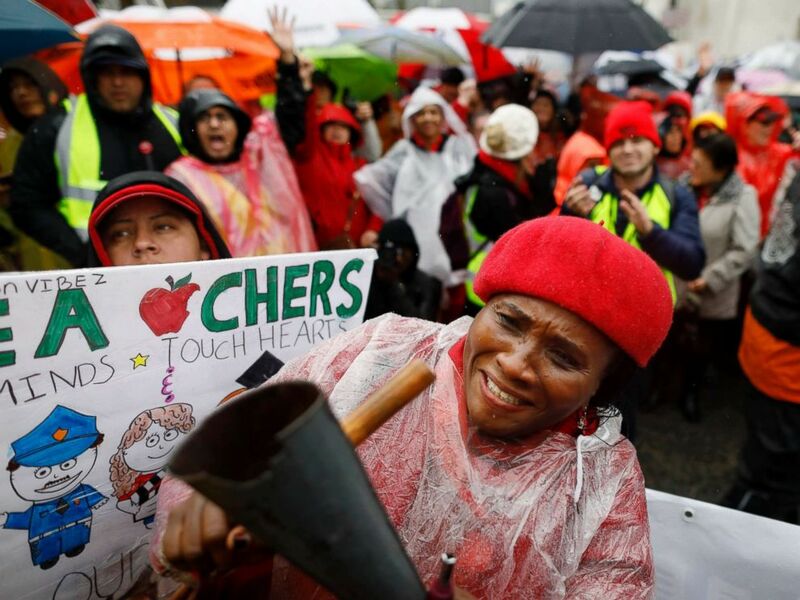 People rally in the streets of downtown in the pouring rain during a United Teachers Los Angeles strike on Jan. 14, 2019, in Los Angeles. It's unclear what progress, if any, is being made at the bargaining table since both sides have agreed to keep the negotiations confidential. California Sen. Kamala Harris, who is also rumored to have 2020 presidential aspirations, tweeted Sunday in support of the teachers. "Students deserve nurses who can treat them when they’re ill. They deserve counselors," she tweeted. "They deserve to have librarians there on a daily basis who can open up whole new worlds. And they all deserve to be paid fairly, along with our incredible teachers." The striking educators are asking for a 6.5 percent pay raise, smaller class sizes and for the district to add about 1,200 support staff positions, including nurses, librarians and counselors. "I have over 1,500 students on my caseload," Yulya Ippolitova, 39, a psychologist at George K. Porter Middle School, told ABC News. "The National Association of School Psychologists recommended ratio is one psychologist to 750 students. Many of us are overwhelmed, working above and beyond to serve vulnerable student populations with no support from the district." Teacher Nkechi Apakama along with Los Angeles Unified School District teachers and supporters gather at Los Angeles Unified School District headquarters on Jan. 14, 2019. School district Superintendent Austin Beutner said last week that the district doesn't have the money meet all of the union's demands. But Beutner expressed optimism that both sides can reach a compromise and break the impasse now that negotiations have been jump-started. "Too many students are missing out on the education they should be getting," Beutner said on Friday. "We need to solve this now and get our educators and all of our students back in the classroom." Beutner said that in the first week of the strike the district lost about $125 million in state revenue payments based on student attendance. A kindergarten teacher at The Accelerated Schools, a community of public charter schools in South Los Angeles joins fellow teachers as they picket outside the school on second day of the Los Angeles school teachers strike, Jan. 15, 2019. Schools have remained open in the district with substitute teachers filling in, but only about a third of the nearly 600,000 students in the district have been attending classes. Many students and their parents have joined teachers on picket lines. 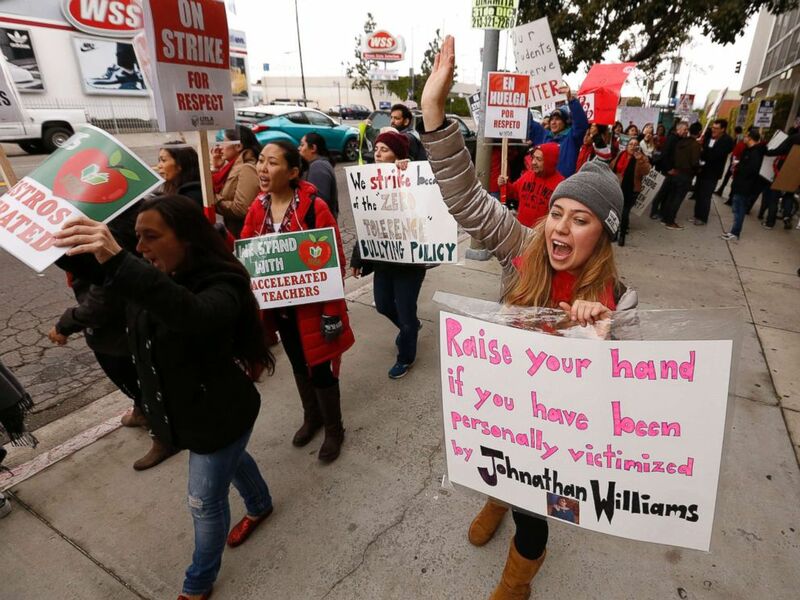 UTLA President Alex Caputo-Pearl has called the strike a "fight for the soul of public education" in Los Angeles. The union has been attempting to get a new contract for two years with no success. Caputo-Pearl said another big sticking point in the negotiations is the union's objection to the proliferation of charter schools in the district. About 1 in 5 Los Angeles public school students attend a charter, the most of any school district in the nation. Charter schools are privately managed and most are nonunion. "If we allow this movement to win, then our schools will be privatized, our students will have less equity and less access, and our jobs and our healthcare will be attacked," said Caputo-Pearl said at the rally on Friday.